Flagstaff is a beautiful city full of many opportunities for landscape photography, especially at night. It is a little known fact that Flagstaff, AZ is an international dark city, actually the first of its kind. This means the city is the perfect spot for stargazing and that is what I wanted to capture. I work in the Admissions Department here at NAU and my goal is to help students decide if NAU is the right fit. I have embodied the job into my creative world by photographing the beauty of our campus. I decided I wanted a picture of the iconic Northern Arizona University sign that is on McConnell drive, right off the I-17. Students who are attending NAU often take photos in front of this sign to declare their affiliation. The photos of the majestic sign are usually from camera phones, in the middle of the day with cars driving in the back. Sure the photos are spirited by it doesn’t fully capture how beautiful our campus could be. So, I waited for a clear night. I mustered out into the brisk night bundled up a beanie, gloves and the like at 1 in the morning on a Wednesday. I decided that time would be quiet on the streets and would help me avoid ambient light. 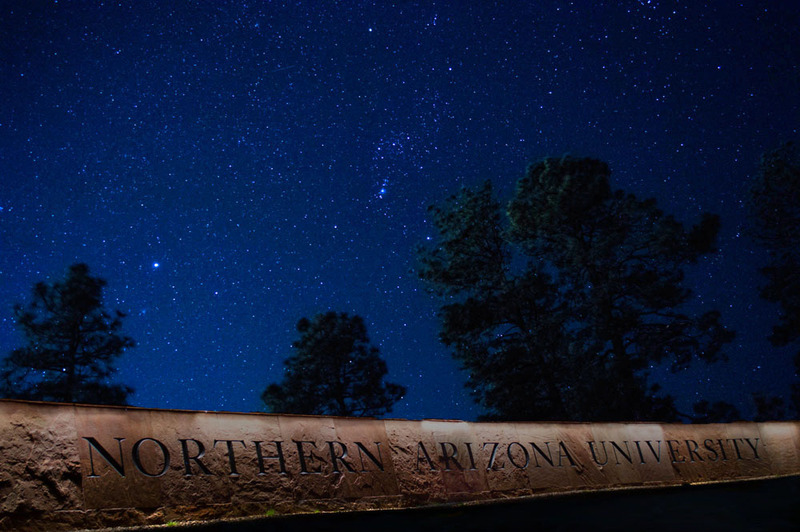 This was important because I had decided I wanted to do a long exposure that captured the stars gleaming brightly behind the NAU sign. I brought my tripod and my camera and set up in the marshy grass in front of the sign. Of course, I had forgotten to charge my phone before I left and it had died before I arrived, but I am glad it did. Not having that distraction allowed me to see the beauty of our night sky. The trick now was exposing the sign enough but making sure the focus was on the stars. It is a composite image. I shot for the sky first at a 20 second shutter speed. Then I shot for the sign which took a bit of work I was not expecting. The light was too low to get a good exposure of the sign without it fading into the background. The shot I wanted had the sign popping out. I thought, “Oh, I can use the flash light on my phone to paint the light!” Then I remembered my phone died. My next thought was, I probably have a light in my car, so I trekked back through the marshy grass and searched my car and finally found a light. It was the perfect illumination for the sign and I was able to capture the vision I had in mind. I shot with a Nikon D3200 at ISO 400 and F/18 at a 20 second shutter speed for the stars and ISO 400 F/18 and 1 second shutter speed. I am a sophomore at Northern Arizona University seeking a Bachelor’s Degree in strategic communications with an emphasis in public relations and minor in photography. My passion for photography started in high school where I learned to shoot film. There is something so captivating in having a hand in the entire photographic process which I learned in film but I know it is a dying form. Therefore, I switched to digital and have tried to focus on composition and creativity. I am so inspired by everyday beautiful things that get passed by and my goal is to capture those ordinary things into something extraordinary. Photography is a hobby for me, but I believe it is a useful skill for the field of communications because photography is a very important aspect of visual communications. I hope to further develop my skills so that I can continue challenging myself and going on crazy photographic adventures that land me on the sides of freeways at 1 in the morning without a cell phone.